Have not terrorists alter our lifestyle? Last week, following Abdeslam's arrest in Brussels, I wrote that terrorism is a distraction. At that time, I was unaware there would be terror attacks in Brussels. And just as it has always been anytime there is a terror attack, attention have been turned away from other issues and the terror attacks in Brussels have been the major focus since Tuesday. The attacks in Brussels on Tuesday took off the attention from President Barack Obama's visit to Cuba, it took away attention from the presidential election primaries in the United States and the appearance of President Obama on Wednesday morning seemed like strange, because few people gave attention to the president's visit to Cuba beyond his arrival there and the Tuesday attacks in Brussels have preoccupied people's attention. It is what crisis that involve massive loss of human lives can cause and slows down progress in other areas of human life. It is what happens when a family loses a breadwinner to senseless killing, and pushing the family into a new and unexpected struggle. The same way it affects the larger community as a family. The families of the 31 victims of Tuesday's attacks will be faced with the magnitude of living without their loved ones, without their help, without their advise and asking why it happens to them. When we leave our home countries to come and live in the civilized world as immigrants, we come to work and earn a livelihood to take care of our families and our future, and not to get killed by terrorists. We believe in the security in the civilized world as better than the security situation in our respective backward countries. We expect to embrace a life in paradisiac life or something close to it, if not actually it. Many immigrants experienced the type of life they expected. But the advent of terrorism has changed both the immigrants and the naturally born citizens of the civilized countries' expectation, from safety to lack of safety, to fear and death in the hands of people seeking to destroy the civilized countries. Who are these people seeking to destroy the civilized world? Where are they from? What is their primary grievance the civilized world? What has been done to address the destroyers' grievance? Are these destroyers pat of us in the civilized world or are they f rom somewhere else? Virtually everyone I have spoken to about these issues say that the situation in the world's home of freedom has changed since the September 11 attack on the U.S. Defending the country against attacks from the destroyers and what presidential aspirants would do to defend the country have become parts of the essentials of a government, in a country that have witnessed so much resources hitherto used for home affairs diverted toward protection and defense against terrorism. You ride in the train with fears in your mind about the destroyers. You walk on a very busy street with fears that the destroyers may attack and get rid of you just like they have been getting rid of so many people who have not wronged anyone. Have not destroyers altered lifestyle here, irrespective of claims by government leaders that they cannot change our life? But has a man or woman who has been killed any lifestyle to maintain? 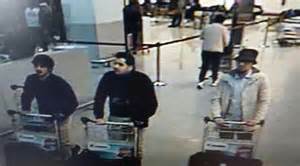 Is not it time to address the issue of terrorism calling leaders of the countries, where these terrorists come from and discuss the need for them to manage their people or risk the ban from coming here? Or for how long will the civilized world continue to allow dangerous people in her all in the effort to avoid a backlash with religion undertone? Is the fear to avoid a crisis with religion undertone more important to lives being lost here to these destroyers?